Black onyx is a stone formed by deposits of silica within the gas cavities of lava. This forms distinctive stripes or bands that are incased within the stone. Onyx is a type of Chalcedony that can be seen as black, white, red, orange, and beige. The name Onyx derives from the Greek word meaning "Claw" or "fingernail" , due to the formed bands on the stone appearing like these two appendages. 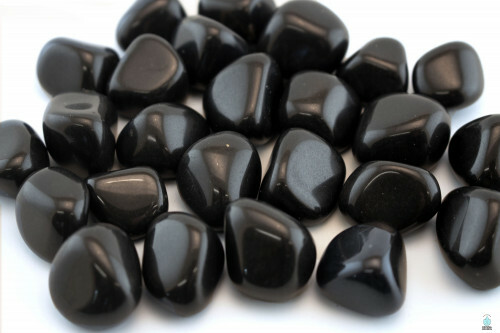 Black onyx is ultiumatelty known to be a protective stone. It lends one the power of a strong defense by absorbing negative energies, and especially assists those who feel like they are being drained of personal energy. A stone of discipline, it aids one in acheiving and "grinding" out their goals and stimulates good decision making. This stone strengthens one's confidence, making the person feel more secure by stabilizing mental and physical imbalances.It will provide the structure that one craves, and to be the master of their own future. One masters the creation of their future by making wise decisions and becoming the driving force of their own lives. When going to a heavily populated area, bring a piece of onyx with you to absorb any possible negative energy and harmful vibrations emanating from others. In addition, Onyx will allow one to absorb and magnetize those energies that are necessary from the universe, and deliver them into the user. Try taking a peace of onyx with you when going to places (physical or etheric) you have never been for protection of the mind, spirit, and multidimensional bodies. This will help one to feel a sense of security and protection, allowing one to exercise their confidence in an uncomfortable or unfarmiliar setting. Onyx will provide one with the raw confidence needed to let go of past selves and bring forth a better, stronger version of you. When a person begins to understand that starting something new isn't a bad thing, they will start to open up their mind to new opportunities and situations. For example, don't be afraid to make a life change if you think it will better your situation in some way. Onyx simply reminds us that you never know how well something can go until you take the risk, and if it doesn't go the way you want, thats ok too. Something can always be learned from failing situations, and something better is always on the horizon. Despite its grounding and protective qualities, Black Onyx promotes a great deal of positivity and optimism during challenging times. The power of Onyx will help to strengthen our emotions and aid us in building the courage necessary to believe in our own power. Negative energy such as stress, anxiety, and fear are simply abolished by this stone's strong countering energies. Black onyx will not only take away negative energies and transmute them into positive, but will also show us that we are stronger than we previously imagined. By understanding this, one can start to feel a deeper level of self faith and confidence that promotes ones true authenticity and uniqueness.